After yesterday's post I thought I'd keep up with it for the entire week. Breaking it down by region. Yesterday was about the feet. Today, for my Top. Top Half. Cover my chesticles if you know what I mean! ;) hehe. I really want a fun new plaid - I think one new one a year will continue to make me the happiest girl! And a new blouse. A great new blouse is always a great investment - I love the novelty of the hearts but reads as a neutral so totally appropriate for work. I just scooped up this jacket this past weekend, she sure is extra pretty in person! What is on your list for Fall/Winter for your top? Yes to the plaid top! I love plaid. There is something so comfy, yet chic about it if its done right! Wonderful purchase!!! Isn't it great finding a piece you have been looking for for a while! Yes, Yes, Yes! I def need to get to Zara. Confession: I've never purchased anything from there. OK, I will email you a list of what you need to buy there. So classic and yet attainable - pricewise! 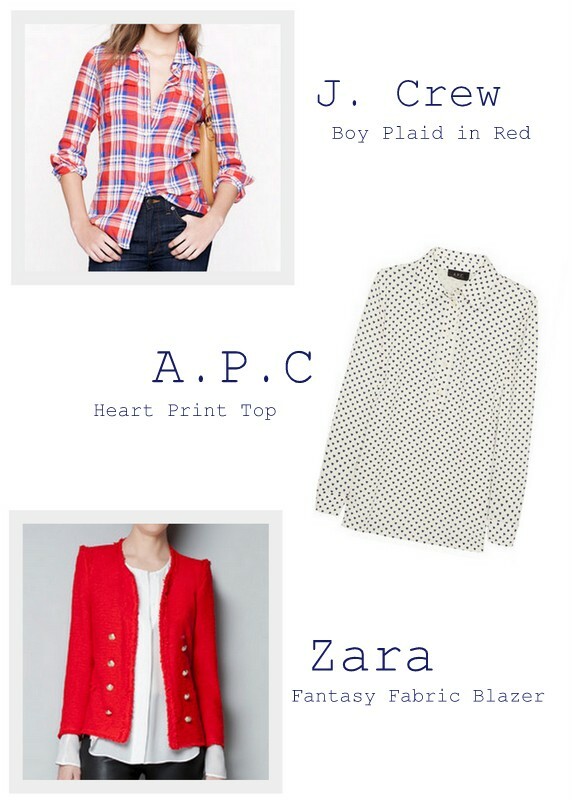 Great picks that would certainly be work horses in my fall closet! I am dreaming of a classic tweed blazer for my wardrobe! love all of these, but that blazer is just divine!! She is AMAZING in person!!! I'm SUPER obsessed with that J. Crew top -- so pretty! i love that blazer! zara always has the best jackets! LOVE the heart print blouse. So incredibly cute. I love all your pictures! That fantasy blazer is perfect for fall in the red! I need to go and check out the new collection at Zara!